‘myBMP’ is a voluntary farm and environmental management system which provides self-assessment mechanisms, practical tools and auditing processes to ensure that Australian cotton is produced according to best practice. The original BMP program began in 1997 and was reviewed and redeveloped in 2006-07 with the new online ‘myBMP’ system re-launched in 2010.
myBMP is the industry’s assurance mechanism, a best management practice system for growers to improve on-farm production. It attends to the industry’s requirement for risk management and supports industry’s social licence. Through myBMP, all Australian cotton growers have a resource bank to access the industry’s best practice standards, which are fully supported by scientific research and development, resources and technical support. • Demonstrating responsible and sustainable natural resource management to the community. myBMP is the result of industry wide consultation with growers, researchers and industry bodies, taking into consideration the requirements of the cotton industry now and into the future. The initiative is supported by the Cotton Research Development Corporation and Cotton Australia. Ginning and Classing modules are also available for the Australian cotton ginning and classing facilities. Each module is assigned a module lead. The module lead is responsible for the content within their module and the additional information and resources attached. The lead for each module is listed below. myBMP is structured into modules. Under each module are key areas. 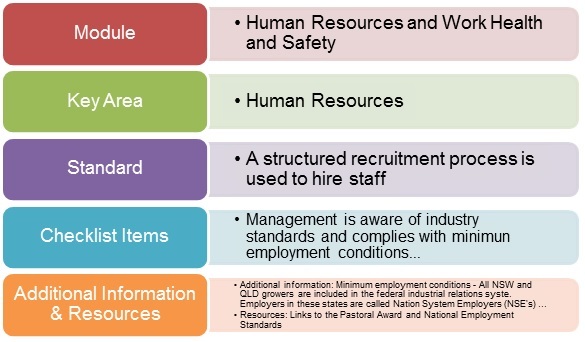 Each key area has standards listed under these supported by checklists, additional information and resources.